In the past, I was a HUGE sucker for beauty products. Anything that promised to make my skin softer, minimize wrinkles, erase signs of aging, make my pores smaller, or turn me into Christy Brinkley over night– I HAD TO HAVE IT! BUT, I’ve recently noticed that I have several drawers full of products that I’ve used a handful of times but haven’t touched since. I’m always disappointed. I mean, really, is there magic to any of these products, or are we just throwing our money down the drain in our search for “perfection”? The thing is, marketing works, and we are suckers for it. OK, HERE’S THE SECRET!! It’s simple and inexpensive. Are you ready for it? 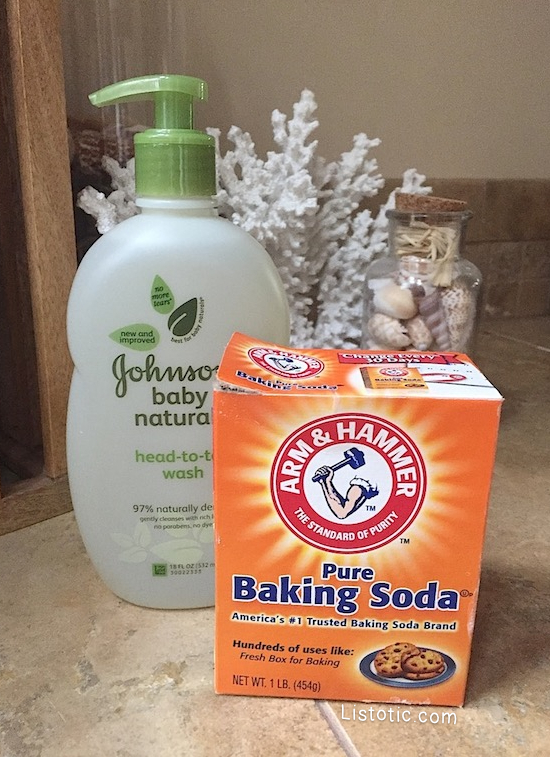 Exfoliate your face with baking soda up to 3 times a week (mixed with just enough water to make a paste), followed by a baby wash to rinse it off (I do this in the morning to prep my skin for makeup). Use baby wash once again at the end of the day to thoroughly clean off your makeup. You can also exfoliate with a wash cloth on alternating days if you have dry, flaky skin like me. That’s all I’m trying to say is, stop over washing your face with harsh chemicals! It causes a mess of unwanted skin conditions. In our never-ending pursuit of beauty, we tend to overwhelm our skin with chemicals, parabens, synthetic dyes, fragrance, formaldehyde, and many other unnatural ingredients. The truth is, simplifying your beauty routine can actually bring out the best in your skin. I have a friend that’s been an esthetician for over a decade now, and I noticed on a trip with her many years ago that she used baby shampoo to wash her face every day. I thought it was odd, especially considering that she had access to all of the latest beauty products a girl could possibly dream of. I, of course, visited the baby isle for the first time in years to pick up a bottle as soon as I got home, and it has literally changed my skin. The only thing I was missing was a good exfoliant, and after some research, discovered that baking soda was excellent for this (and super cheap!). The powder is really fine, and because of this, I think it does a much better job at getting rid of dull, flaky skin than the leading exfoliant products. Anytime you can go as close to natural as possible, you will find the results are well worth the time and effort. This includes anything and everything that you put on your body (soap, lotion, cream, shampoo, deodorant, makeup remover, etc.). Unfortunately, most of us don’t start running towards the natural, less-harsh products until we start having side effects. Kind of like faithfully applying sunscreen every day AFTER you start noticing sun damage. In fact, even acne-prone skin responds better to natural products. Believe it or not, your body instinctively produces an abundance of oil if it’s robbed of its natural oils (from harsh cleansers), causing a havoc of pimples and black heads. Rose Hip Oil is better than ANY other moisturizer I’ve ever tried. It will make you glow! It goes on silky smooth and absorbs quickly so it won’t leave you with a greasy face. I apply it in the morning to my face, neck and chest. I also use coconut oil for my body, and it smells amazing! I also use Peppermint Castile Soap in my bath a few times a week to soothe my dry, itchy skin (especially in the winter months). It’s liquid and can be used for many other purposes, too. In fact, it’s so gentle, it can be used to wash produce. Neem Oil is amazing for your skin and hair. I apply it to dry patches of skin or eczema, and once in a while to the ends of my hair before washing. It has a strong earthy odor, but I don’t even notice the smell anymore. According the the reviews, it’s also great for acne.